American Eagle Outfitters is a clothing and accessories retailer based in America and headquartered in Pittsburgh, Pennsylvania. They offer several brand names and they are well known for their affordable and contemporary style, which mainly targets 15-25 year old males and females, but also offers a wide selection for other age groups. American Eagle Outfitter stores are known for their white wooden shelving, tables, and clothing racks. They also have sofas, chairs, a TV and quiet music in the background to set the ambience for a comfortable shopping experience. Jerry and Mark Silverman who previously operated Silvermans Menswear founded American Eagle Outfitters in 1977. They ended up selling their rights to the brand in 1991 to Jacob Price and now the store has expanded to become the parent company of Aerie and 77 kids. When the Silverman brothers originally established their business, they mostly stocked merchandise that was suited for outdoor sports, such as hiking, mountain climbing, and camping. As the business was transitioned to Jacob Price the store’s selection shifted more towards general clothing and accessories targeted at a younger demographic. Since then American Eagle has opened up hundreds of stores within the United States and have signed franchise agreements to move their stores overseas. There are several stores in the Middle East including Dubai, Kuwait, and Beirut. They have also expanded operations to Asia and Europe with stores in Beijing, Shanghai, Warsaw, London, and many more. Customers who want to shop online for the company's products will need to visit their official website at ae.com. Here they can make great savings by redeeming American Eagle Outfitters coupons, a list of which we keep up to date here at Coupofy. AE.com also have an app that enables customers to shop on the go. It's only available for the iPhone at the moment though so other users will have to use the website for their purchases. If you still want to shop at one of the many American Eagle locations, then simply use the store locator on the website. This feature is quite essential, because you will need to find a brick-and-mortar store if you intend to use American Eagle printable coupons. The company has a variety of clothes for both men and women. The Men’s selection includes shirts, tees, graphic tees, sweaters, hoodies, sweatshirts, polos, jackets, jeans, shorts, socks, shoes, boxers, briefs, accessories, and cologne. The Women’s selection includes shirts, tees, graphic tees, sweaters, hoodies, sweatshirts, tank tops, layering bralettes, polos, ponchos, kimonos, jackets, jeans, shorts, leggings, skirts, socks, shoes, accessories, and fragrances. They also have a lingerie line called Aerie that offers pushup bras, sports bras, swim suits, tops, bottoms, sleepwear, and more. American Eagle offers an extensive jeans selection for both men and women including jeggings, high-rise cut, skinny, boot cut, athletic cut, relaxed fit, and several more styles to suit your needs. Depending on what's available at the time your American Eagle Outfitters coupon code may be applicable for any product, or specific products only. There is also a unique feature on the American Eagle Outfitters website that is known as Reserve, Try and Buy. Customers can ask a local branch of American Eagle Outfitters to reserve a particular item so that the customer can visit the store and try out the item, before they decide if they want to purchase it. This feature helps the customer come to a more concrete decision about whether they should buy the item or not. Customers can also sign up for a mobile alert if the product they want is offered in a local store or is available online. This feature is essential for busy customers who do not have the time to check up on their favorite items to see if they are available. 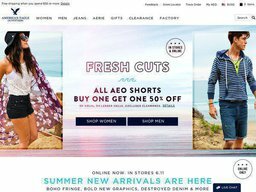 American Eagle has included several features on their website to increase customer satisfaction, which is an important goal for them. Customers who have purchased their products could even be featured on the website. If you're a member of Twitter or Instagram, then all you have to do whenever you upload the photos if tag them with #AEOSTYLE. American Eagle Outfitters accepts most major credit cards on their website and at the store including Discover, Mastercard, and Visa. They also accept AE gift cards and Paypal payments. While on the website, it's also a good idea to check out their AEO rewards program. After signing up, you'll be entitled to earn 40% off your purchase at both AE and Aerie. Every time you spend $1 in the future, then you will earn a point. Your points will be totaled every few months and you'll be sent out your special American Eagle discount code for savings. American Eagle Outfitters also offers AEO Credit Cards that give you 15% off your first purchase and also offer discounts at American Eagle Locations. To redeem any American Eagle Outfitters coupon code all you have to do is enter it in to the promo box before payment. Within the United States AE.com offers free 2 day shipping on all orders over the value of $65, with the offer extending for a full year. Orders between $50 and $64.99 are shipped for free via Standard Delivery. Under this threshold you are charged a flat rate of $7 regardless of the size of the order. UPS 2nd Day is $15, and UPS Overnight is $20. American Eagle has an excellent return policy that allows you to obtain a refund or exchange if you are not fully satisfied with their products. Customers can either return the item to a brick-and-mortar store or they can ship the item back.